For over 14 years, CSRWorks International has celebrated excellence in sustainability and responsible business practices in Asia. This year, we shine a spotlight on the increasing number of women who are driving change through sustainability leadership. 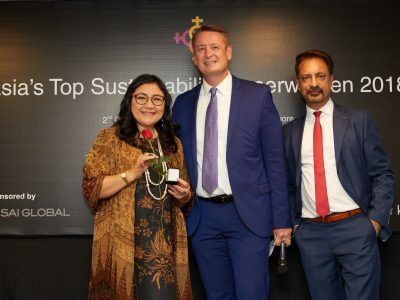 CSRWorks International is pleased to present Asia’s Top Sustainability Superwomen, an annual listing of exceptional female sustainability leaders in the region. By recognising the accomplishments of women, CSRWorks International is supporting the network of women who drive positive change in the world. 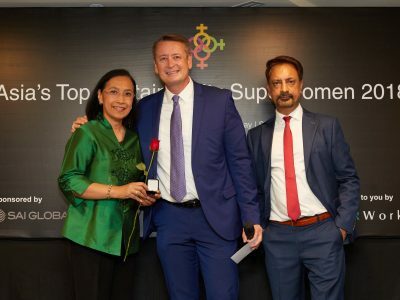 The Asia’s Top Sustainability Superwomen 2018 list was announced on 2nd october in singapore at a networking cocktail at the Asia Sustainability Reporting Summit! 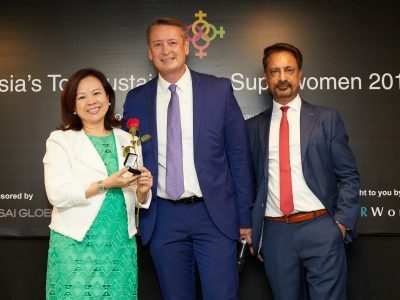 Eight Sustainability Superwomen who were present at the event received their award from GRI’s CEO Tim Mohin who was the Guest of Honour. Check out 2018’s Sustainability Superwomen here. 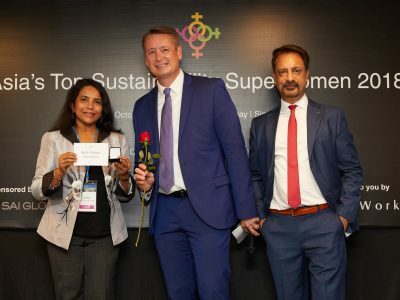 A Sustainability Superwoman is someone who is leading change through sustainability strategies and initiatives within her organisation as well as outside of her organisation. 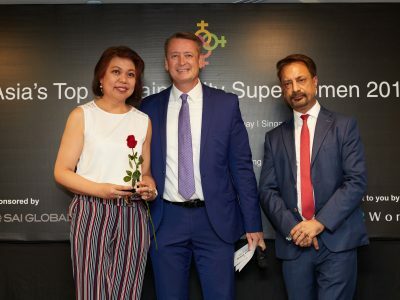 We invite nominations of women who are on the frontlines of sustainability to be considered as Asia’s Top Sustainability Superwomen. 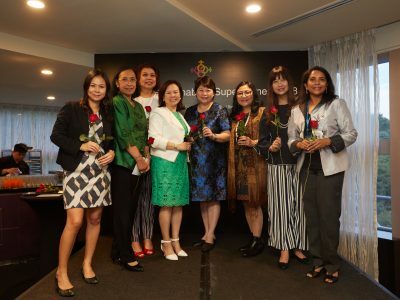 The nominations are open to native Asian women working in Asia. Also eligible are expatriate women who have lived and worked in Asia for at least the past 5 years championing sustainability. The nominee should be in a senior management role with a demonstrable commitment to sustainability. Examples include CEOs or equivalent, executives directly reporting to CEO, Chief Sustainability Officers or Head of Sustainability or similar positions or equivalent positions if the nominee is from the non-profit, government or other sectors. The nominee may be a woman leader in any sector, industry or organisation including but not limited to businesses, NGOs, government organisations, development organisations, media and academia. The nominee should have held senior management roles for at least three years. Nominations may be made in the following ways using the online submission form linked at the bottom of this page. Only one nomination form is required per candidate. Self-nominations are welcome and encouraged. Nominations for 2019 edition are now open. Nominate now! Last day to submit your nominations is on 19th July 2019. 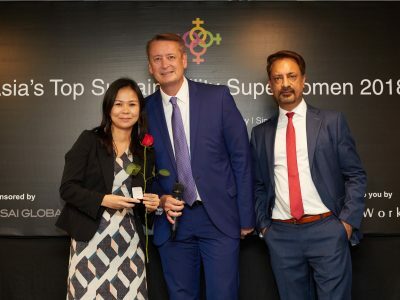 Nominees for Asia’s Top Sustainability Superwomen will be reviewed by an internationally distinguished jury. The judges will look for specific examples of strategies, programmes, initiatives or contributions resulting in noteworthy change. Check out the SuperJury! When is the 2019 list announced? 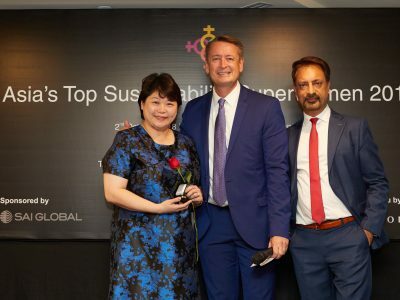 Asia’s Top Sustainability Superwomen is an accolade to honour and recognise the inspiring efforts of women in Asia who are leading change within and outside their organisation, at the forefront of sustainability leadership. The logo portrays the story of the empowered woman, pushing her limits with passion and grit. The Venus symbol, formed by a circle and a cross, is associated with goddess Venus, the embodiment of prosperity and victory. The logo combines four of these symbols to create perfect harmony and showcase strength in unity. This signifies the rise of female power and influence in the world around us. Each insignia extends past the boundaries of the logo, reflecting the limitless capabilities of a woman, hindered by no obstacle. There are four featured colours: Tango Orange, Pistachio Green, Gold and Red Violet. Tango Orange is the colour of enthusiasm, motivation and positivity. Pistachio Green is the colour of growth, abundance and glory. Gold is the colour of optimism, success and confidence. Red Violet is the colour of passion, courage and strength. Each have a significance of their own but together, they birth the very definition of what it is to be a woman. The logo in essence, represents a compass. This multi-directional nature is not only symbolic of the growing global presence of women leaders, but more importantly, it heralds the undeniable and irreplaceable role of women in paving the way forward for a sustainable future. 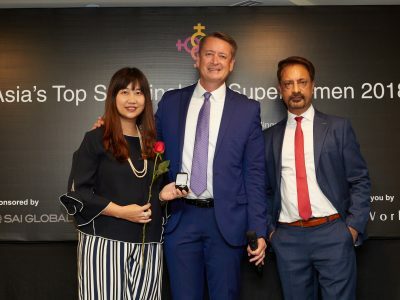 How to nominate a Superwoman? Nominations must be submitted using the PDF form. Want to be a sponsor? Interests are invited from organisations who would like to sponsor the Asia’s Top Sustainability Superwomen initiative. Please write to superwomen@csrworks.com now.